Manoa is a residential neighborhood located on the beautiful island of Oahu in Honolulu, Hawaii. Located in the valley at the base of Wa’ahila Ridge, this community stretches from the Manoa Falls to King Street. Manoa has a rich history of native Hawaiian settlement and is the founding place for the University of Hawaii at Manoa. The daily rain and common rainbows are where the university got its nickname, the Rainbow Warriors. Manoa’s beautiful scenery, rich heritage, and closeness to downtown Honolulu are what makes it a must-consider destination for home buyers across the island of Oahu. The Manoa Marketplace is the main center for shopping and dining in the community. With local supermarkets, restaurants, and drugstores, residents have easy access to these everyday amenities. For those who desire a larger variety of shops and entertainment, downtown Honolulu is only three miles west of Manoa, where you will find movie theatres, full gyms, ocean access, and other amenities. Manoa is home to its own parks and schools, which cater to the needs of children and family residents. 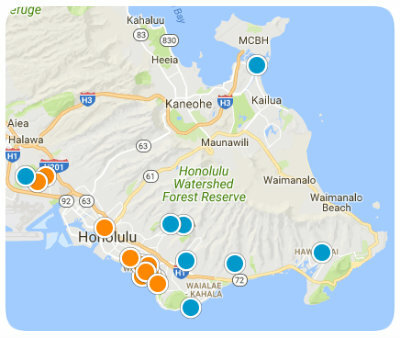 From Kamanele Park to the Manoa Valley District Park, residents will find public swimming pools, sports fields, and hiking pathways for their enjoyment. Buy a home in Manoa and enjoy the many amenities, luxuries, and recreation that this town has to offer. Home to remarkable real estate opportunities, Manoa contains single family homes, condominiums, and townhomes. Depending on the size, location, and age of the property, prices range from affordable starter homes to grand scale estates. As many homes were built in the 1960’s, home buyers will also find an array of both old and new construction in the neighborhood. Choose from homes with ocean views, expansive lots, and swimming pools. As there are plentiful real estate options, home buyers will surely find their dream home to suit all their living needs. If you would like more information regarding homes for sale in Manoa, please allow us to assist you and contact us today.